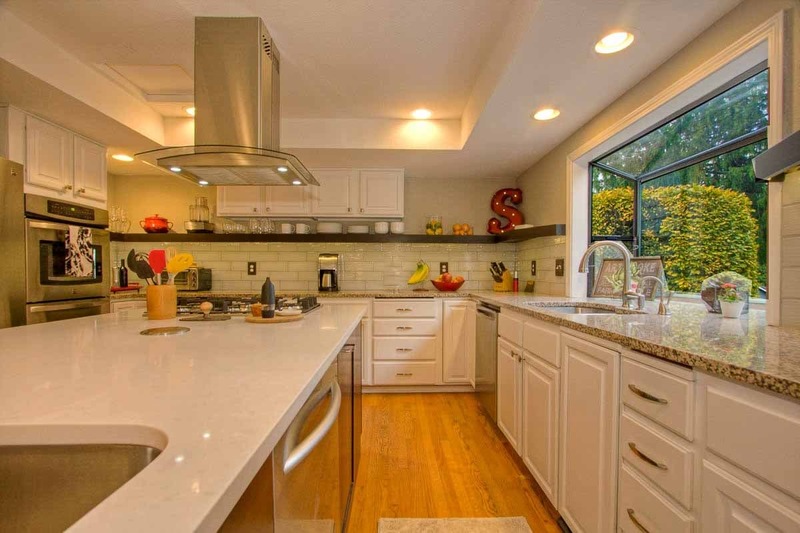 The owners of this Capitol Hill home love to cook; in particular, they love to bake. 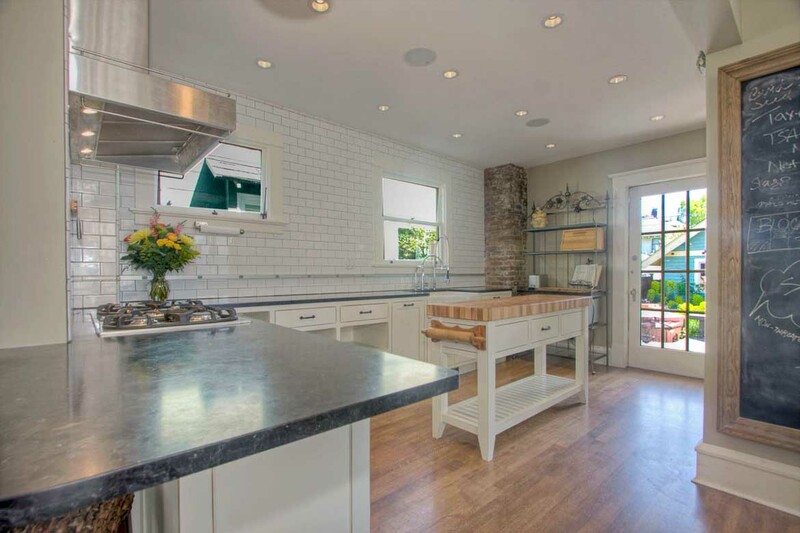 They needed a complete kitchen renovation that would offer an open concept with exceptional functionality. Using the tile up the wall offered a great look and easy cleanup option. 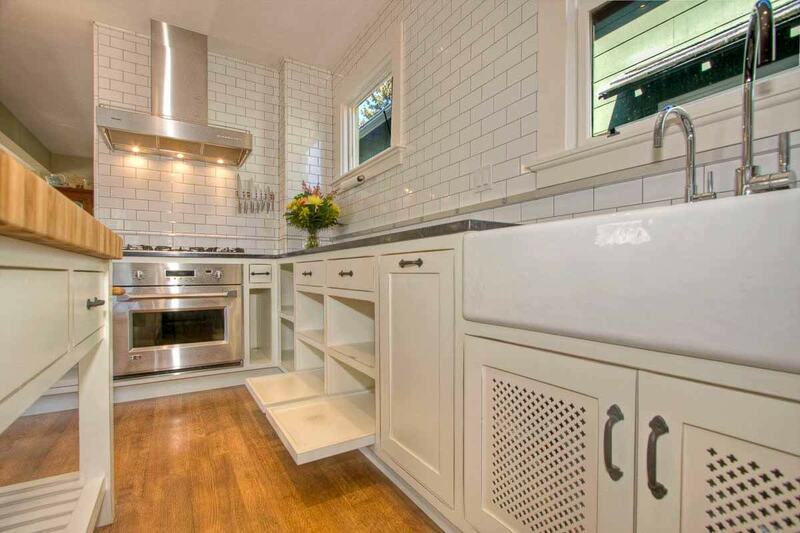 Top of the line appliances and a butcher-block island completed the look. 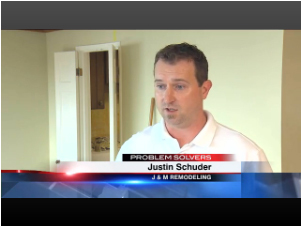 We contacted Justin in November 2011 to bid on our project, remodeling the kitchen and both bathrooms. He came right out the next day, quickly did a thorough review of the project, and responded within a couple of days with a competitive, detailed proposal, which we selected among five other bids. Most of the work was handled by a two-man crew, Nate and James, but four other contractors came on the job at different times for extra hands or when a specialist skill was needed. The crew is great to work with; friendly, courteous, considerate, and diligent. They keep a clean job site, removing trash and debris frequently. We liked that the J and M team was small and easy to work with, but also big enough to bring on more people when required. 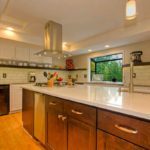 J and M handled everything in the remodel except for the cabinetry, countertops, painting, and shower doors, which we contracted out to others, an arrangement which saved us a considerable amount on the job. J and M’s work included all the demolition, rough carpentry, plumbing, electrical, tile, and the finish and trim work. They worked really well with the other contractors, coordinating schedules and working out dependencies as needed. They also bought all required materials with a reasonable markup, but allowed us to buy the more costly items to avoid the markup, often using their contractor discounts saving us even more money. We worked from rough designs, which led to frequent changes, including a few major changes. They were very flexible, handling everything, working with us to get exactly what we wanted. We did find that it was important to write down changes—an email was enough—as some things were dropped when communicated verbally. Some changes were the result of problems uncovered during the remodel. The crew always communicated things quickly as they came up, and were very creative, usually giving us several options to solve the problem. For example, we got stuck trying to work out how to install an electrical outlet on the kitchen island, and Nate worked out a way to cut down some plug mold to fit perfectly on the island trim. It looks great! The craftsmanship was generally above average and in some cases, excellent. They will take on anything but were best with rough construction, woodwork, tile, electrical and plumbing. They had trouble with the floors and some finish details. The oak floors required sanding, staining and sealing, and they struggled to get a consistent, smooth finish after going well over budget on the sanding. It was partly due to the challenging nature of the floor—uneven, out of level surface and grain variation—and partly limited experience on their part. I want to emphasize that they absorbed most of the cost overrun and in the end the floors look good, but this part of the job definitely pushed their limits. They are also easy to do business with. Their invoices are timely, detailed and easy to understand. They provide receipts for all purchases, were quick to respond to billing questions and have been very reasonable in working out any issues that came up. They started on schedule in mid-January, and finished a bit later than planned, about 10 weeks later—reasonable for the size of the job and the number of changes that we made. We were generally happy with their progress throughout but did have to push at the end to get things wrapped up. We love all three rooms, they turned out even better than expected and really make the house beautiful. Overall, we are very happy with J and M. They are reliable and responsive, and will provide quality contracting work at a reasonable cost, but you do need to spend time working with them on the project to get the best result. We will work with J and M again as well, already scheduling a media room project and potentially a studio/office remodel. That probably says as much as anything about our level of satisfaction. Clicking any of the images below will display the photo in its full size. 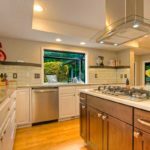 When we first saw this kitchen, it was unchanged from its original construction in 1986, with oak cabinets and a dividing wall that closed the kitchen off from the attached bonus room. Because this home already had both a formal dining room and a family room, the bonus room was essentially wasted space. 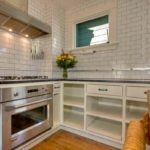 We ended up increasing the footprint of the kitchen by removing the dividing wall, and adding a very large island to incorporate the entire space. 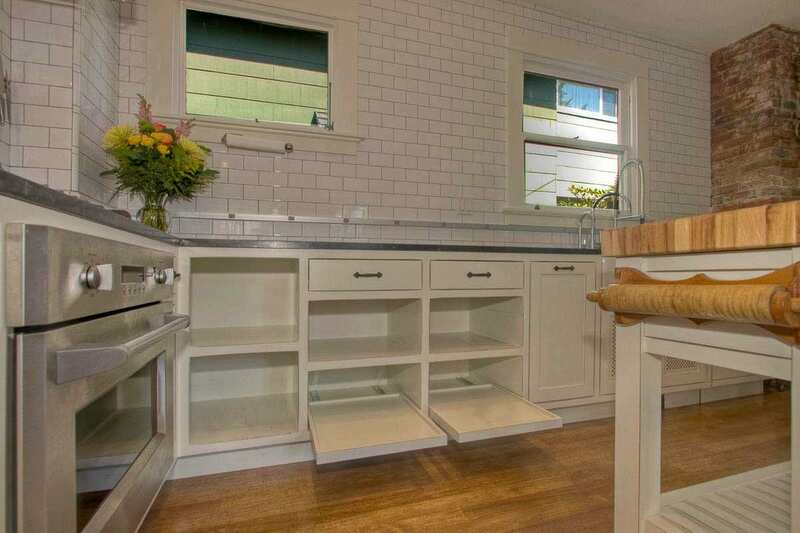 The kitchen features two sinks, two dishwashers, hidden outlets on top of the island, under cabinet LED lighting, and much more. A West Seattle business that needed to update their commercial kitchen contacted J & M Remodel about the project. 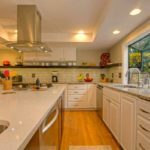 The kitchen needed to remain extremely functional, and the project had to fit within a very tight budget that the business allocated for the kitchen remodel. The final result turned out very well, and we were able to complete the kitchen within the client’s budget and timeline. We worked on three separate units within this Pioneer Square building as the owners converted the building from office space to condominiums in response to the Seattle tunnel project. The units were completely renovated, including adding kitchens and bathrooms. Much of the original Pioneer Square architecture remains, with the addition of modern elements that complement the brick and exposed beams. Clicking the image below will display the photo in its full size. 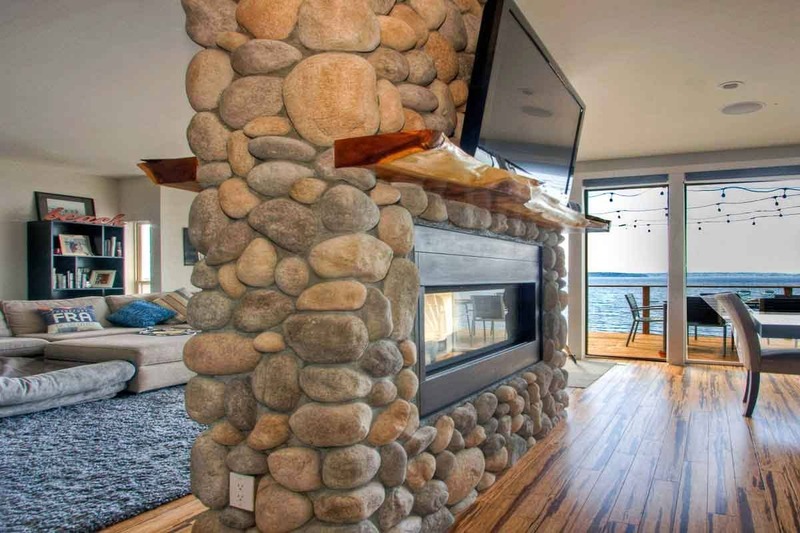 This fireplace was transformed from dated white brick to gorgeous River Rock, adding a special feature to this northwest contemporary home with its sweeping views of the Puget Sound. If the right product is not used, River Rock can end up looking very fake and unnaturally discolored. Eldorado Stone, a synthetic product, was used in this project. In our experience, Eldorado Stone provides the best combination of natural appearance along with ease of installation. There are few better ways to add value to a home than with a large, gorgeous deck. Not only is your living space increased this way, but also the overall look a deck adds to your home’s exterior is second to none. This deck project made good use of the client’s lot, and the curved deck surface and rail added a high-end, custom look to the home. When J & M Remodel completed the project, this fireplace certainly became the focus of the formal living space in this home. 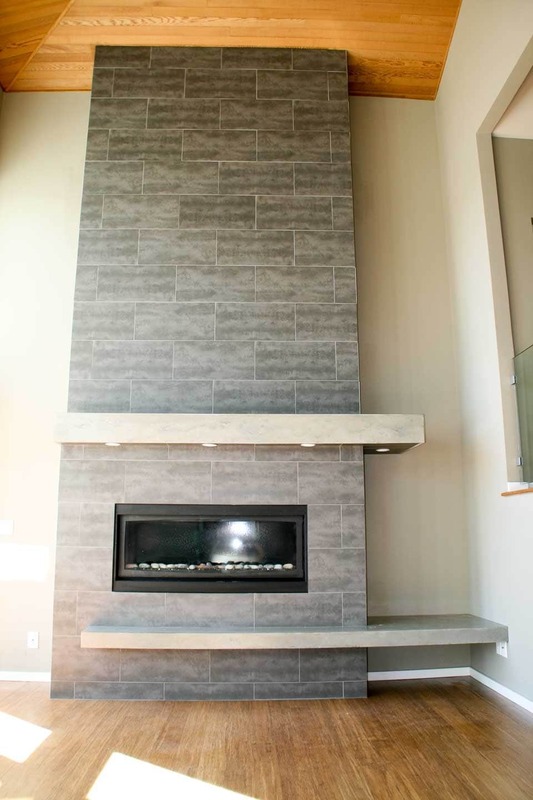 The fireplace surround was tiled from floor to ceiling, taking advantage of the soaring ceilings in the home. A contrasting mantel with built-in lighting completed the look. J & M Remodel was contacted by this client after their previous contractor completed shoddy work and left the project hanging. Needless to say, after that experience, the clients were apprehensive and cautious in selecting a new contractor. 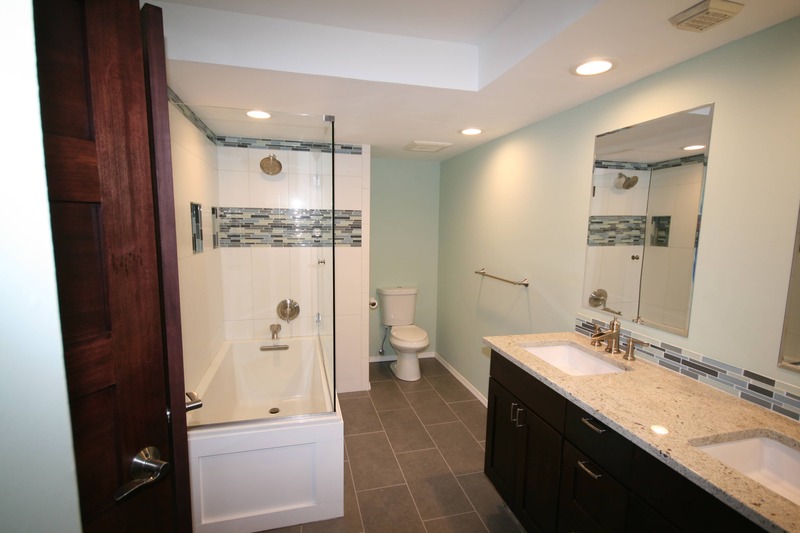 The clients had already selected the design and fixtures, but extensive re-work was necessary to complete the project so that the bathroom will stand the test of time. We agreed on the layout and plan, and were able to complete the project to the client’s satisfaction with a beautifully grand master bathroom and fireplace. When I arrived to this clients home to prepare an estimate for their main bathroom, it was clear to me that the bathroom was built in the 1960’s. It was severely dated and needed to be completely renovated. The original tub was made of cast iron, and of excellent quality, which enabled us to re-glaze and conform the tub to the new bathroom layout and design. We worked with this client to select a modern aesthetic design, including fixtures and cabinetry from Kholer of Bellevue, for a bathroom that combines beauty and ultimate functionality. Justin met with us to go over our project. One of the challenges was enlarging a tiny shower enclosure. Justin was able to sketch up an idea to move the wall out a foot on two sides. The end result is fantastic. Ehren was our onsite construction specialist and all facets of his work were excellent . He was easy to work with, and communication was top-notch. We appreciated his approach to involving us in some of the finish ideas, i.e., did we prefer the tile to run this way or this from a visual point of view. Both Ehren and Justin were 100% committed to making sure we were happy with their work. The highest compliment is to use a contractor again which we plan to work with Justin and Ehren on our next project. 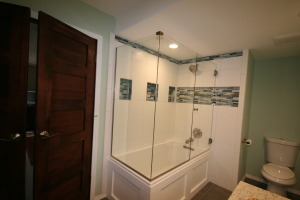 We Transformed a dated master bathroom, in a downtown Seattle area condominium, into a modern sanctuary. 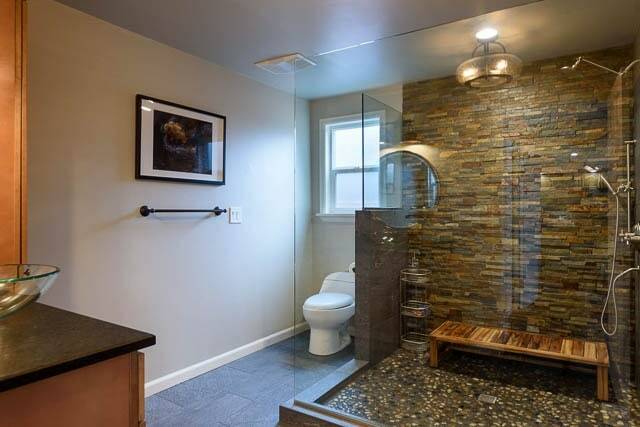 Complete with a walk-in closet, deep soaking tub with a glass enclosure, and a back-lit glass block toe kick. The final result was truly an urban oasis.